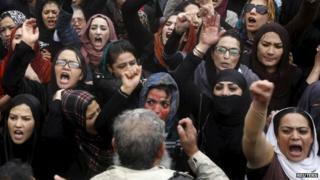 BBC Afghan's Karim Haidari says that the lynching of a woman who was falsely accused of burning the Koran reflects the ugly and misogynistic nature of parts of Afghan society. It has been four nights that I have been struggling to get any sleep. What keeps me awake is the noise of an angry mob and the images of the bloodied and burned body of a woman, beaten to death. The frenzied attack on Farkhunda happened thousands of miles away in my hometown of Kabul, but the violent scenes have followed me here all the way to London. Perhaps I feel guilty for being a man. After all, men are the authors of all wars. Or for being an Afghan man. Men in my country inflict similar misery upon women time and again in one corner of the country or another. I left Kabul weeks before Farkhunda set foot in the Shah-Du-Shamshaira (The King of Two Swords) shrine. It is a beautiful building on the banks of the Kabul river in the centre of the city. The main bazaar and the presidential palace are both within walking distance. People often come here to make a wish or seek resolution to a problem by tying a ribbon on a tomb in the grounds. A few weeks before I left Kabul I went to the shrine to tie a ribbon on behalf of a friend in California. She had asked me to take a picture and send it to her. As I climbed the steps, I noticed a large group of women gathered nearby. It was a Wednesday, a traditional day for female worshippers to visit shrines across the country. I made my way inside and fixed a piece of shiny green polyester to one of the four cloth covered poles at the tomb, adding to the dozens already there, all in different colours, attached to the top of the tomb and the interior walls. "What did you wish for?" a middle-aged woman asked, straining to make herself heard above the noise of the crowd. I responded, "A wish is a secret, Khala (auntie)." As I was leaving, I noticed at least two old men with long beards and white turbans, sitting very close to the women and scribbling something on small pieces of paper. That too is a common sight. Women come to ask such men for charms or amulets to help deal with a family problem - to bring good health to their husbands, to keep their sons safe in the army, or to find good husbands for their daughters. It is a source of income for such poorly educated mullahs - however dubious the service. In Afghanistan both on television and on social media there is growing criticism of this practice, with people saying that it is not only an abuse of Islam, but also fraud. Farkhunda, the woman who was killed in Kabul last week, was one of these critics. A theology graduate, she went one step further than speaking out in the media. She actually confronted one of the mullahs selling charms to childless women at the shrine. In the course of the argument, she was accused of burning the Koran. It seems the crowd overheard this and attacked her. She must have underestimated what some men are capable of - not just cheating women out of their money, but actually - from one moment to the next - taking a woman's life under the eyes of the police. There is always a big crowd of young men outside the shrine. They come to look at the women, in the hope of maybe catching someone's eye and engineering an encounter. At least 20 people have been arrested so far in connection with Farkhunda's murder. Many are young, modern urban men. Many have Facebook pages where they claimed responsibility for the attack. For many Afghans - me included - it is upsetting that young men like this, can suddenly transform themselves into misguided protectors of the holy book, and that they are capable of such appalling violence. A young life has been painfully lost to unveil a society where many have a poor understanding of religion, and where scholars often make premature judgements - only to recant later. It is a society with a corrupt and incompetent police force, where the end of women's suffering is still a distant dream.